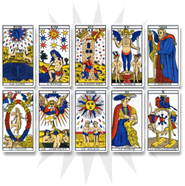 The four of spades refers to professional and material problems. Influenced by the clubs, this card evokes difficulties in your job or in the realization of a project. It often symbolizes renouncement or abandonment when a difficulty comes up. In cartomancy, this card is a bad omen that invites the consultant to put things into perspective and question himself/herself. In the following weeks, you will have to face material problems. 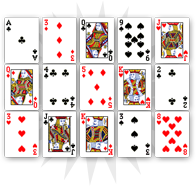 The four of spades evokes disorder leading to resignation. Nevertheless it encourages you to self-questioning and you will find solutions to get over your difficulties and react. Use your dynamism to develop your competencies and take advantage of your qualities. 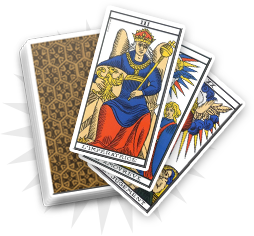 The four of spades evokes one of your relatives who will cause you material problems. Often represented by a dark-haired woman, this card can also describe an external element that will disturb you. It could be a colleague who would try to slow down your project, or an event that you could not anticipate. In any case, you have to be careful and take some distance with the persons from your professional and personal circles. 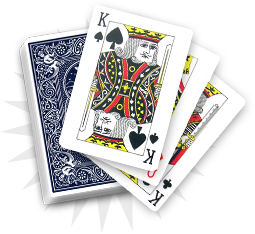 But do not panic: the four of spades engages short-term difficulties and you will find a solution to avoid the problem.